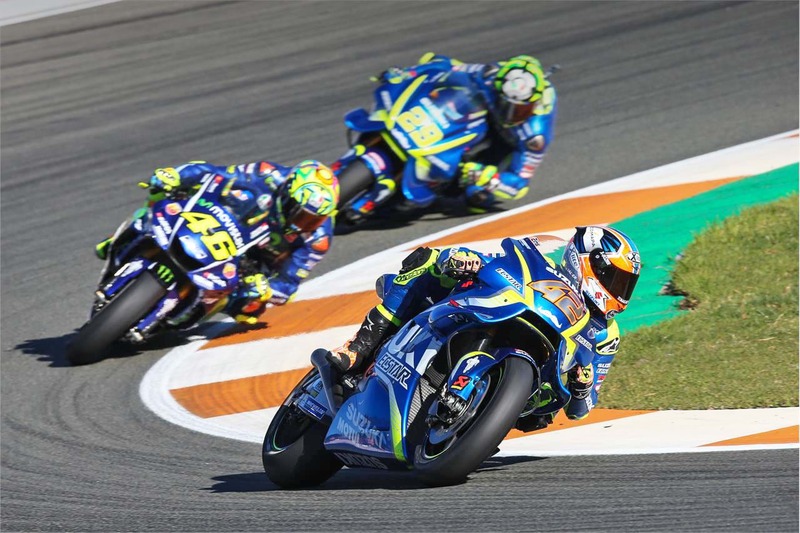 Alex Rins took a season-best finish of fourth place at Valencia for the final round of the 2017 MotoGP championship, realising the potential the young Spaniard has promised all year. Starting from 10th on the grid, Rins dropped to 13th on the opening lap, but soon was confident in his potential to achieve a good result, after posting the second fastest time in morning warm-up. 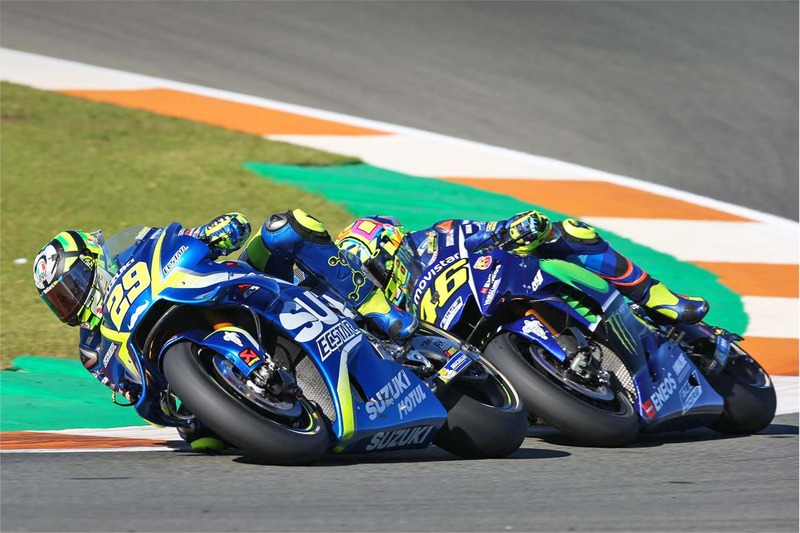 He began to move his way through the field, posting similar lap times to the leading group, and eventually passed his teammate, Andrea Iannone, who qualified for the race on the front row of the grid. Rins would eventually take the chequered flag in fourth place, with Iannone sixth. Rins started the year in Qatar as the highest placing Rookie, but a number of injuries hindered his progression. However, coming into the final rounds of the year, the former Moto2 race winner and championship runner-up began to show his talent and potential as a front-runner in the MotoGP class. He said, after the Valencia Grand Prix, "Overall it was a good weekend. We had been improving in each session and we qualified directly to Q2. In the qualifying I expected to get a better position, but otherwise it went well. "We had a good pace in the warm-up and I was convinced that I could have a good race. At the start I made a mistake and lost positions, so I had to push from the first lap and try to recover. I think it's a good way to close the season. Now I'm thinking about the training on Tuesday to start working for next year." His teammate, Iannone, also had a strong start to the year, but struggled for pace and form in the middle of the year. However, he too, began to show his obvious talent in the final rounds, with the promise of stronger results next season. He added, "It has been a very positive race and we managed to finish within 14 seconds of the winner, and that’s not so bad. This means in the last races we made some good improvements. "It’s been a pity to be in front at the beginning of the race and then lose some positions because I couldn’t push the brakes to the maximum. In this category, when you are not able and get the best from the braking, you suddenly lose three or fourth tenths per lap. "But I’m very enthusiastic now because we restart on Tuesday. A new season when we will surely have new expectations, a new bike, and, I hope, things to make us better." Team manager, Davide Brivio, said of the campaign, "I’d call this race in Valencia a good end to the season. This season has been pretty tough for all of us, although in the last five or six races we have been able to become more competitive. Since Japan, we have done what we had the potential to do since the very beginning, which is somehow comforting for the new adventure of next season. "I really want to say a big thank you to everyone, the crews, the engineers, and the whole team. It’s never easy to keep your head up when things get hard, but we did it as a team. We kept calm, we stayed focused, and finally we recovered. Let’s take all of this and use it to our advantage in the new upcoming season."